The LVCN-130 series has been discontinued. Please contact our Flow Engineering department. The LVCN-130 dual sensor controller accepts two sensor inputs for automatic filling and emptying operations. 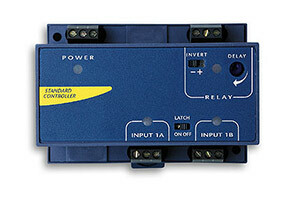 The latched 10 amp relay provides the control interface with pumps and valves. The controller has a time delay feature dampening out relay chatter. Other features include selectable normally open or normally closed relay states and latch on or off relay conditions. The controller is designed for installation on EN 50 022 standard 35 mm DIN Rail or it can be panel mounted. For CE approved controller, add suffix "-CE" to model number, add $50 to price.